During the interwar period (1918–1939), Kojima Gyokuhō (1907–1934) produced lyrical woodblock prints that drew from the visual vocabulary of textile design, Kabuki costumes and ukiyo-e masterpieces. Though little is known about the artist beyond his collaboration with the publishing house Happōdō in Kyoto City, the works displayed here, from the series One Hundred Poetry Illustrations, exemplify the ways in which artists of the Shin Hanga (New Print) Movement sought to preserve the workshop-based system of woodblock printmaking during the early 20th century. At that time, Japanese society was quickly becoming Westernized, causing such traditional styles of artmaking to lose popularity. 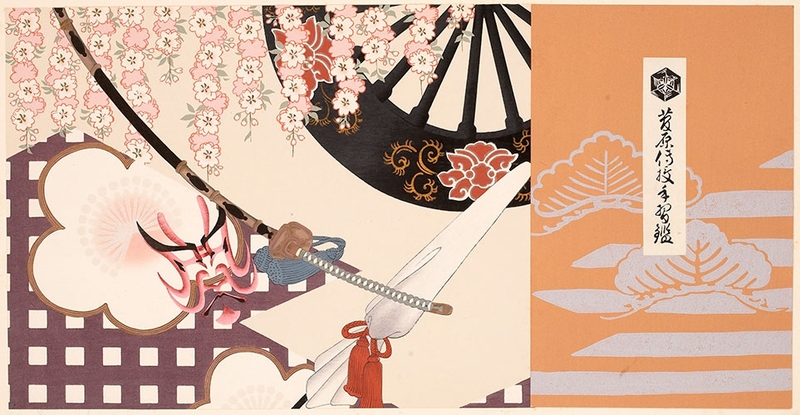 Titled after famous Kabuki plays and Jōruri puppet performances, these prints were presumably designed as cover illustrations for their libretti.